What’s the relationship between the cartoon and the grid? This question gave illustrator Åge Peterson a scholarship from Grafill last year. The support resulted in a series for six posters and his very first solo exhibition in Bergen this fall. The exhibition is named ‘Mise-en-scène’ — an ancient expression from the movie industry used to describe the arrangement of scenery and stage properties in a play or film. 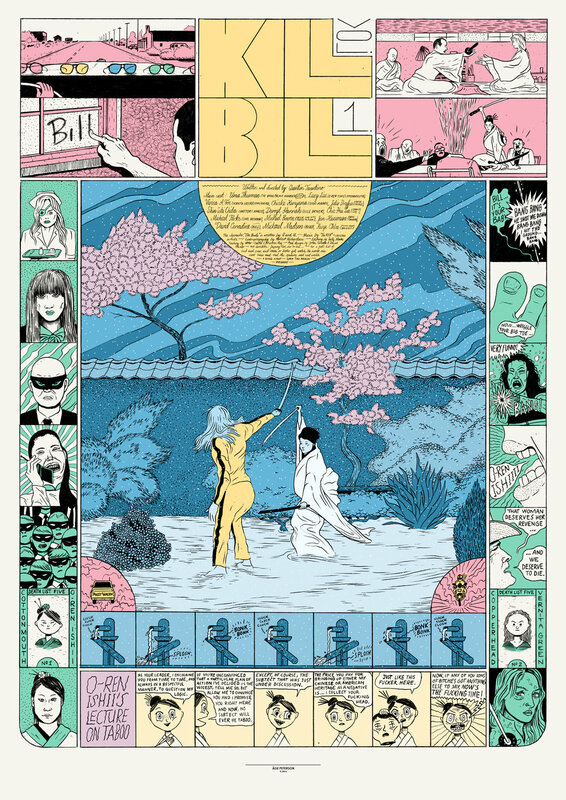 Åge created posters for six different movies using the language of comics and different conceptual grids to express his love for the particular movies. The illustrator says in an interview with Grafill that the posters are anything but traditional. The series demands a significant higher level of close reading than the ones we’re familiar with, where the information should preferably be instant communication, often at a distance. None of the posters are made to ‘sell’ the movies, neither to tell the complete or linear story of the individual movie. They express the interpretation and aspects he finds intriguing. The grid was given the primary role, as a carrier and limit for the narrative flow, illustrations, speech bubbles, and other information from the movies. "I had never before given hierarchical design choices such a guiding role in the development of a cartoon, which was the central component throughout the research. Grid as a guiding factor for layout in graphic design is essentially made to be invisible, where the typography and images alone should be characterized by order, which was made possible by the guidelines," Åge explains. "The grid is often highly visible in cartoons as it is a central part of the end result in terms of the individual panels, the grouping of panels and the panel groupings up against each other. I have styled the film titles in contrast to the film’s official logo deliberately, thus giving myself creative freedom to develop my own expression. The typographical aspect of the movie titles, based on the underlying grid, became an important motivation for the project, and in itself a governing factor for the structure, the illustrations and the design in its entirety."